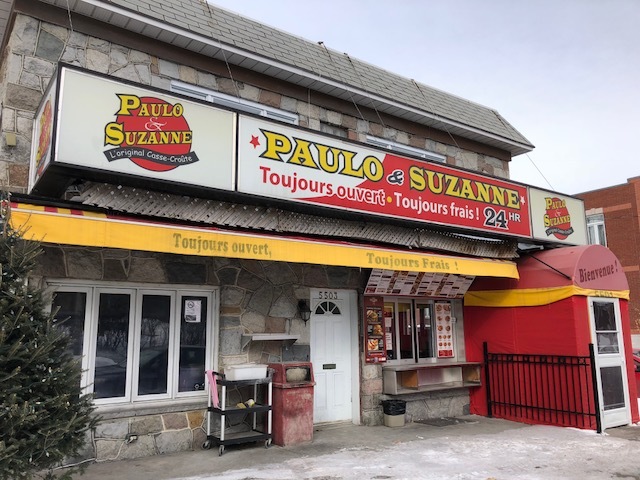 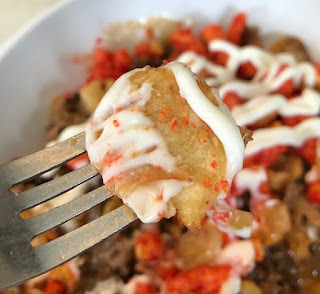 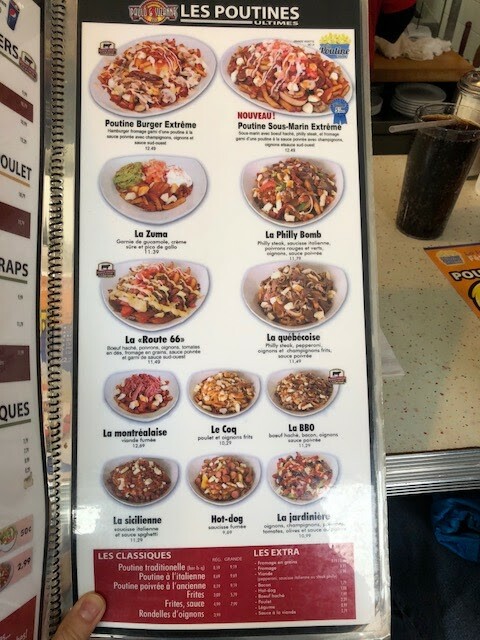 Paulo et Suzanne is in Cartierville, Montreal, and it's about an hour away as I stay in downtown, but they're serving Flamin' Hot Cheetos Poutine for La Poutine Week 2018 so I really had to go. 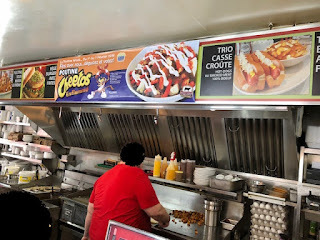 They're 24 hours open and I went there for lunch on Saturday. 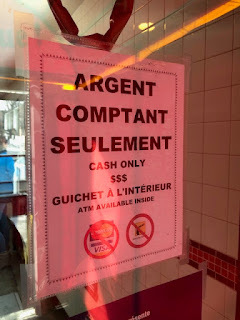 CASH ONLY sign on the door. 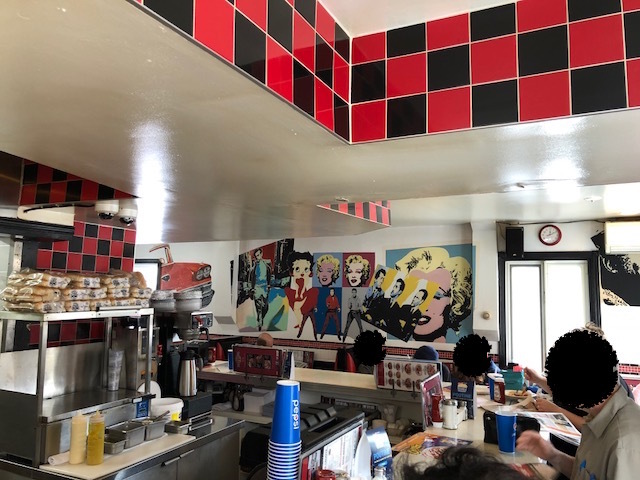 There're counter table and regular tables with chairs, and we sat at the center. 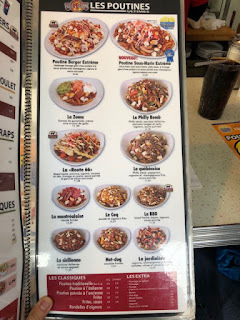 They were using this placing mat for each customer. They had many poutines and my husband added 2.99 dollars for his burger to upgrade his fries to poutine. 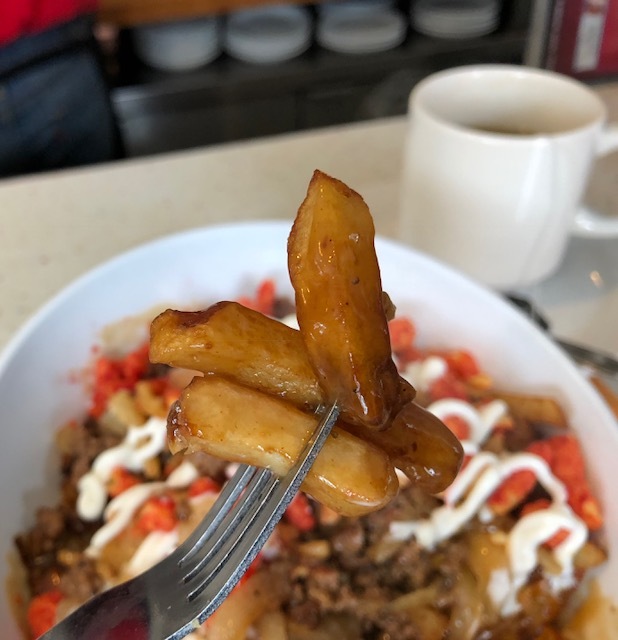 The kitchen started cooking my poutine, and they're grilling the a patty of angus beef and broke into pieces, sauteed onions, and put them on a plate. 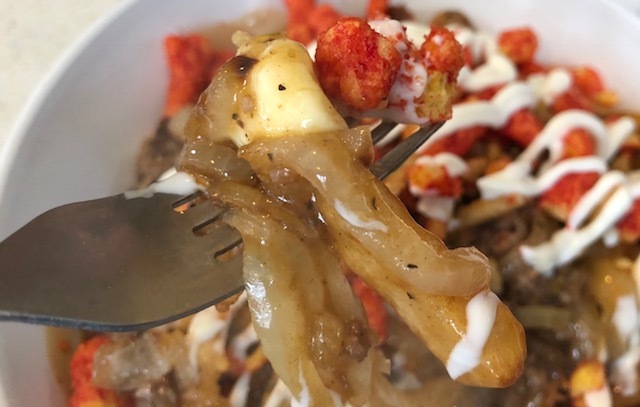 Then another person poured lots of fries into a bowl, put gravy sauce, cheese curds, beef, 2 kinds of onions, then added Cheetos and sour cream. 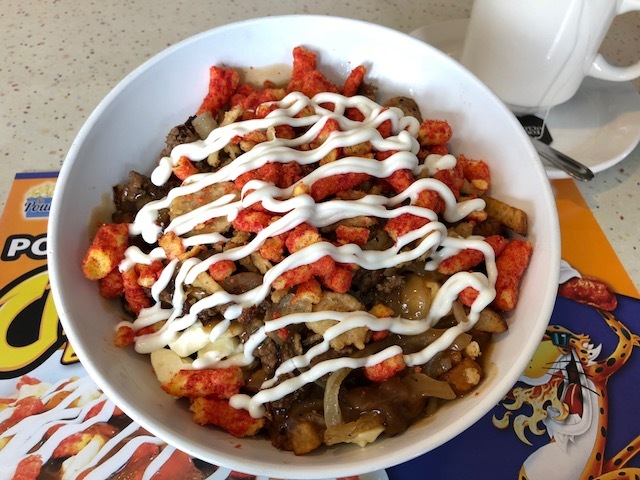 Fries, gravy sauce, cheese curds, fried onions, sauteed onions, ground Angus beef, Flamin' Hot Cheetos and sour cream. 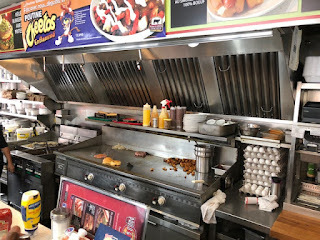 Sauteed onions were soft and sweet. 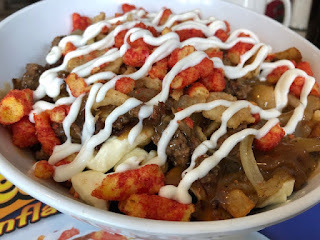 Ground beef was juicy and seasoned with something similar to Old Bay spice. Fries were thick and caught the gravy sauce well, but Flamin' Hot Cheetos, sour cream and seasoned ground Angus beef had strong flavors so that I didn't really taste the gravy. Crispy onions were crunchy and light, and so were Cheetos. 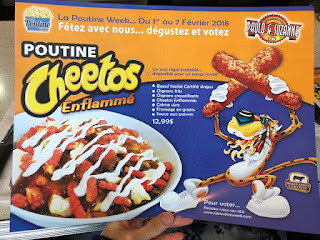 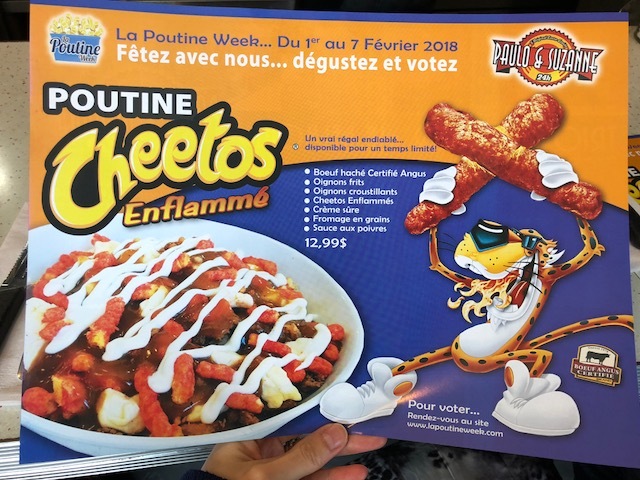 Snack (Cheetos) went well with this traditional Quebecois dish so well, and for the food and atmosphere, it's worth over an hour trip to come here. All the staff was friendly, food was great, and there're many more items that I wanted to try, and though it's far, I'd love to come back to this diner again.